A luxury service that can save you thousands of dollars. What is full room carpet dyeing? Full room carpet dyeing is the process of permanently changing the color of a carpet by adding an immediate and colorfast carpet dye solution. Outdated colors. High quality carpet is made to last 20 or 30 years, so chances are the carpet will “ugly out” before it wears out. Put a fresh updated color on your carpets with The Carpet Chemist full room carpet dyeing service. Camouflage imperfections. There’s nothing worse than spending thousands of dollars on high end nylon or wool carpet and having the kids and pets dirty it up with spills and stains. Consider full room carpet dyeing from The Carpet Chemist, to deepen the color of the carpets, or change to a color that will hide those pesky blemishes. Save money on replacement. The Carpet Chemist saves our full room carpet dyeing customers on average, 60% to 75% of the cost of replacing their high quality nylon or wool carpet. Sun fading. Natural light shining through windows or skylights can remove color from carpet. Churches, office buildings, residential homes, etc are commonly affected by sun fading. High pH chemical color loss. Commercial properties that higher inexperienced carpet cleaners or janitorial companies, or even in-house maids to clean their carpets often suffer from high pH chemical color loss. This is what happens when they use copious amounts of soapy chemicals to clean the carpet, and it looks faded or dull. The Carpet Chemist can bring your dull and lifeless looking carpet back to looking new again! The Carpet Chemist dyes are guaranteed to be immediately permanent and colorfast for the entire life of the carpet. Our dyes will not bleed or fade, and they are completely odorless and Eco friendly. A common question we are asked is, what color can you dye your carpet? Great question. The rule is you can always dye carpet a darker color, but you cannot dye it a lighter color. For instance. Lets say you have a good quality nylon carpet that was purchased and installed in the late 90’s early 2000’s, and it’s still in great shape structurally but the color is nauseating! What are your color options? OK, so green is blue with a little bit of yellow. The easiest and most effective outcome would be to keep it in the same color family. So one suggestion might be to bringing that dreary green color to a deeper more vibrant blue color. Or if you have a light beige carpet in your rental home, that you paid quite a bit for, and you want to change the color to a medium brown to hide traffic patterns and stains, we can certainly do that for you as well. 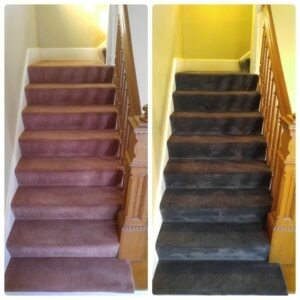 Upload a pic of your current carpet along with room measurements for an instant quote. Our IICRC-certified team provides no-obligation estimates. Connect with our team at (800) 515-1342 or by using the secure form below.